Universal Environmental Technology (UET) is a worldwide leader of chemical-free water treatment solutions. We have developed a range of revolutionary products that improve the performance of water systems, minimising costs and helping the environment. Our technology reduces the need for precious drinking water to be used for industrial applications, increases water re-use, and reduces the release of hazardous chemicals and other additives into the environment, protecting our eco-system. UET has vast experience in solving water problems with scientifically based non-chemical treatment at power plants. For example, for treating cooling towers where the water source to the cooling tower is limited and poor quality, UET’s technology allows the blowdown of the cooling tower to be discharged to the ocean, instead of complex and expensive waste treatment before discharge. Most water treatment systems produce compounds that damage the performance of water systems. At UET, we believe in working with nature and restoring balance to industrial water systems by encouraging the natural reactions of the water. UET’s products are designed to remove only the excess of minerals that cause scale and heavy metals build-up, corrosion and bio-contamination. We use the natural attributes of water to solve costly problems in water systems, thus improving their performance. Our philosophy is to flow with the water, not against it. UET’s end-to-end solutions are customised to suit your engineering requirements, either for new installations or as retrofit to existing water systems in industrial, commercial and municipal facilities. We use scientific-based algorithms together with extensive field research engineered to solve common problems using off-the-shelf products or custom-made solutions designed with the appropriate combination to rebalance troubled systems. UET’s vision is to provide the world with the benefits of its unique technology. We work with visionary engineering companies and agencies worldwide and with major industrial companies who are keen to use green technologies to improve water efficiency. UET’s revolutionary technology enables economical industrial water use with excellent technical results at a wide range of water qualities sources. Our partners around the world will help with the design, manufacture, installation and servicing of UET systems and we call all users or companies who seek to take part with our vision and join the naturally treating water revolution. UET is the leading international company in the field of non-chemical water treatment, based in Israel with a worldwide network of partners. Our revolutionary solutions are based on technical and engineering knowledge, combined with extensive experience – our systems are installed in over 4,000 installations worldwide. Our treatment concept and its applications are protected by nine patents and recognised by the USA-EPA, ANAB, and RONET (ISO 14001:2004 and ISO 9001:2008). In the Siemens-owned solar power plant in Lebrija, Spain, UET was hired to solve problems of poor water quality and improve cycles of concentration at a major cooling tower with the capacity of 12,000m³/h. UET units were installed and the crew was trained in their operation. 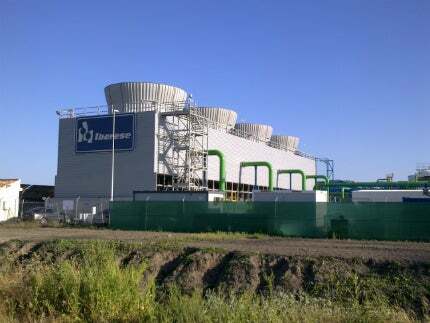 After completing three years of operation without applying chemicals, the heat exchangers were inspected and found to be free of scale deposits. Today the plant is saving about 90,000m³ of water and half a million dollars per year by reducing its chemical, servicing and water costs. UET have released their newsletter from earlier in the year, showing the results of their specialised treatment at the Solar Power plant in Lebrija, Spain. A water treatment system which harnesses the natural properties of the water to solve scale, corrosion and biolife problems by applying a designated chemical reactor to react the excess of minerals naturally present in the water.